Your time as a student is an incredibly important stage in your professional development. It is a time to nurture your talents, learn new skills and gain experience of the many different career and life options available to you. We believe you should be recognised for all the extra-curricular activities you participate in to boost your career prospects. Take a look below at some of the awards and recognitions schemes available to you. Do you know an outstanding individual or group who volunteers in the student or local community? 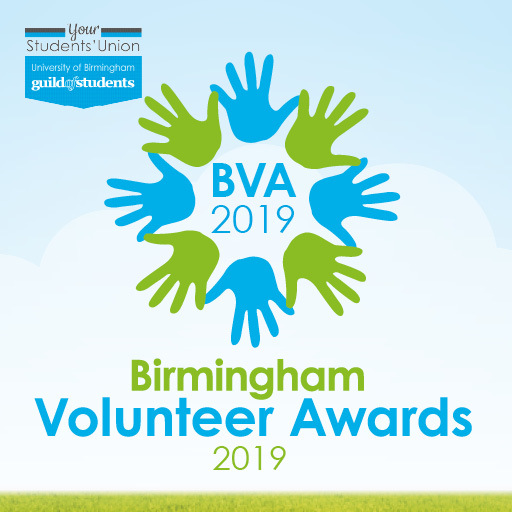 If so, help them celebrate their achievements by nominating them for a Birmingham Volunteer Award! You can nominate individuals or groups for achievement, dedication, leadership, global impact or volunteer activity provider Awards. NOMINATIONS HAVE NOW OPENED FOR 2019! Download an application form and the nomination guidelines below. You could nominate a volunteer project, any student group committee member, your Hall Rep, an external volunteer, a club captain, your student rep, a global buddy, a part-time officer or anyone else who volunteers their own time to help others! Winners will be invited to attend an Awards Ceremony on Monday 17th June 2019. Student Employee of the Year (SEOTY) is a national competition set up to recognise and promote the outstanding contributions and achievements of students, who effectively combine part-time work with their study commitments. These awards are at institutional, regional and national levels and are run by the National Association of Student Employment Services. Your opportunities to learn and develop your skills extend far beyond your degree. The award-winning Personal Skills Award (PSA) recognises your extra-curricular activities and provides well-prepared evidence of your achievements to future employers. The scheme has been designed to enable you to develop and recognise your personal and professional skills by undertaking optional activities and/or employability modules whilst at University and reflecting on your experiences. Guild Volunteer? Student Group Committee Member? Student Staff? You can all receive the recognition you deserve through the PSA scheme! Every year, we host an awards ceremony to acknowledge all of the amazing events, activities and contributions that students make to university life throughout the academic year! Student groups, employees, volunteers are all awarded at an ‘Oscars style’ recognition ceremony – and it’s always one of the highlights of our year. If you believe you or your student group deserve to be considered for a Guild Award, please come and speak to the Student Groups team for information on how to nominate. Details of Guild Awards 2019 will be released in December 2018.